Before Fallout 76 is even launched we now know that a patch is required to 'fix' the game and it's not going to be a two minute download. Some users with download caps will struggle to keep up as this 'patch' is almost the same size as the original game. So, if you cleared out just enough space to load the game you'll have to find a lot more... It's arriving on ALL platform with the PS4 version the largest at 47GB (initial game download was 53GB) once the patch is applied you'll need almost double the space of the original game, not that's big! PC and Xbox owners patch is only 15GB. In just two weeks the game has gone from a 53GB install to nearly 100GB (RDR 2 is 108GB) If you've bought them bother you may need a bigger HDD. "This update will be large compared to what we expect for patches going forward." Bethesda have said this, prior to releasing, update - so that's OK then! 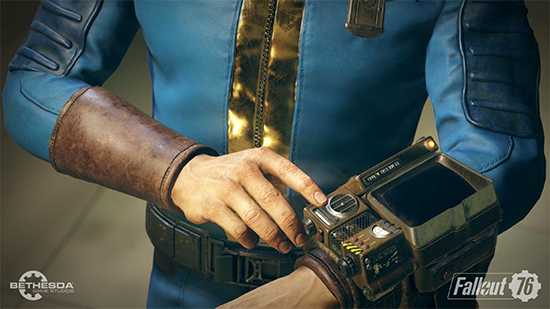 Our latest patch for Fallout 76 brings additional performance and stability improvements and many bug fixes to the game. Read on for details about everything that’s coming to the game with today’s patch. Xbox: Fixed an issue that could lead to instability on certain menus. Ambient Occlusion: Placed items no longer leave behind shadow outlines after being picked up. Camera: The game camera now pans more smoothly when the player enters furniture. Graphics: The cover of Tesla Science magazine Issue 9 no longer appears solid red on pickup, or when inspected. General: Fixed an issue in which some enemies could chase the player farther than intended. Loot: Ghoul and Scorched Officers now correctly drop nuke code pieces upon being killed by a player. Repair: Fixed an issue that could cause an item to return to a broken state after being repaired. Bureau of Tourism: The Prickett’s Fort Token Dispenser can now be repaired, and players can no longer walk through it. Respawn: Choosing the "Respawn" option after dying during PVP combat will now correctly clear any active hostile status toward other players. Seek Revenge: Cap rewards will now display correctly when choosing the “Seek Revenge” respawn option after being killed by another player. Seek Revenge: When targeted by another player who is seeking revenge, the reward amount will now display the correct number of Caps that can be earned by killing that player. Languages: Korean fonts will now be displayed correctly in game menus. Hotkeys: The “Take Photo” hotkey can no longer be rebound and is now tied to the space bar on PC and the A button on controllers. Hotkeys: Fixed an issue that could cause the “Take Snapshot” button in Photomode to display an incorrect hotkey. Social: Fixed an issue that could cause players to disappear from each other’s social menus if two players each sent a friend invite to one another. Social: Fixed an issue that prevented newly equipped Player Icons from displaying to other players in the Social Menu.